Look at this booth and how awesome it is to see these two excited Girl Scout Daisies when you walk into the Montrose Walmart. But, it’s not just the cookies they are excited about, it’s the men who play an active roll in their Girl Scout experience, and support these future women to be outgoing, honest, fair, and kind. These men are patient as the girls are figuring out how much money the customer owes, and as the girls count the money back to them as well. If you notice one of the dads also has a three-month-old baby (future Girl Scout) strapped to his chest. These men do not let anything get in their way to be able to support their girls in reaching their cookie goals. 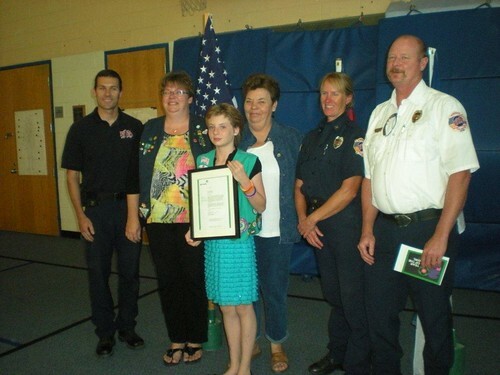 Congratulations to Montrose Girl Scout Elizabeth Giles, who earned Girl Scouts’ highest award, the Gold Award over the summer of 2012. To earn the Gold Award Elizabeth made 13 quilts for the Bright Beginnings Preschool and Childcare Center, who was very excited to receive the finished project which they plan to use in their infant room. Elizabeth said the quilts “will remind the kids they were thought of and cared for.” Elizabeth learned to quilt when she was 8-years-old from her Grandma. Elizabeth is currently a freshman at Colorado Mesa University in Grand Junction. Through Girl Scouts, Elizabeth said she learned many valuable things and gained lifelong friends. The Girl Scout Gold Award represents the highest achievement in Girl Scouting; it recognizes girls in grades 9 through 12 who demonstrate extraordinary leadership through sustainable and measurable Take Action projects. Since 1916, girls have successfully answered the call to Go Gold, an act that indelibly marks them as accomplished members of their communities and the world. Pictured is Elizabeth with Daycare Center Directors, Amber Gardner and Casey Best. The Montrose Daily Press also ran a story about Elizabeth’s Gold Award project on Nov. 22nd.